Founded in 1067 and greatly expanded during the 12th and 13th centuries, Waltburg castle was a formidable fortress built on a hill 1300 feet high, giving the castle a tremendous defensive advantage. The castle has two towers, the South Tower which was used as a dungeon, and the castle keep. Wartburg castle suffered damage during the 17th century, but it has been successfully restored since then. 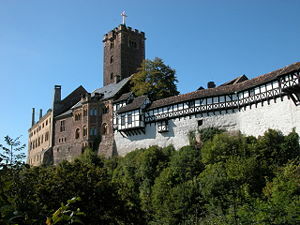 Wartburg had great significance in the history of Germany and the German development of Christianity. During his exile at Wartburg Castle, Martin Luther translated the New Testament into German. This castle is also a powerful symbol of German union. Today the castle serves as a museum where tourists can see how and where Martin Luther lived as well as plenty of the German history embedded to this castle.